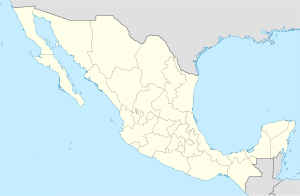 Molango (officially Molango de Escamilla ) is a town and one of the 84 municipalities of Hidalgo, in central-eastern Mexico. The municipality covers an area of 246.7 km². As of 2005, the municipality had a total population of 10,385. Molango comes from the Word Molanco a nahuatl name that means place of the god mola a pre colombian deity that represents the surrounding mountains and was worshipped within the territory by Nahua and Otomi People's Who still live within this municipality to this day. The three languages spoken within molango are Spanish Nahuatl De La Huasteca Hidalguense and Otomí-Tepehua. ^ "Molango de Escamilla". Enciclopedia de los Municipios de México. Instituto Nacional para el Federalismo y el Desarrollo Municipal. Retrieved December 27, 2008. This article about a location in the Mexican state of Hidalgo is a stub. You can help Wikipedia by expanding it.